I’ll be writing the remaining articles for this series in the coming days and weeks. Part 5 of this series is all about the code, and optimising the performance of our Pi. An arcade button, connected across GPIO21 and Ground. We can remotely connect to the Raspberry Pi (via the steps described in Part 2). Connecting to the Pi remotely has the advantage of giving you a larger screen, and is the approach I would recommend. The above will create a new directory (/home/pi/photo-booth/), and then download the Raspberry Pi Photo Booth code, for you to use. Now that the code has downloaded, we can open up Python and run the Photo Booth code. 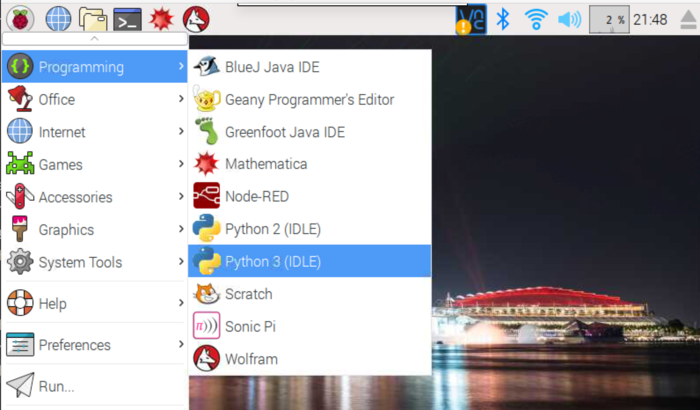 One method of doing this, is opening the Applications menu, and selecting Programming then Python 3 (IDLE). My code is also compatible with Python 2, but Python 3 is currently recommended. Within the Python GUI, you can then the code we downloaded via File>Open. 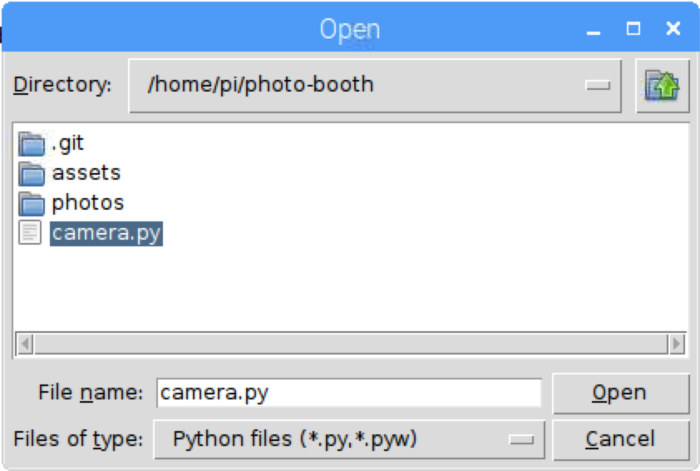 In case you are curious, why not have a look at the code within the python file camera.py? I’ll try to explain the various parts as they appear in the file. These libraries provide simple mechanisms for dealing with images, timestamps, the Pi’s GPIO pins, and other complex features. This means our code doesn’t need to consider all of the intricacies that are associated with such things, and that saves us a bunch of time. The photo booth is now version 2. The Configurable options are now defined within config.yaml instead (otherwise, the behaviour is the same). You can modify any of the values above to adjust the behaviour of the photo booth. Per the above, my camera is mounted with a rotation of 270°, but if your camera is mounted at a different angle then you will need to adjust this value. After defining our configuration options, there is a number of “helper functions” defined. It’s not super important to understand how these work. Finally, the file defines the main function, which is effectively the “start” of the program. intro_image_1 = REAL_PATH + "/assets/intro_1.png"
intro_image_2 = REAL_PATH + "/assets/intro_2.png"
Generate a filename for our images (which is based on the current date + time). We are going to take 4 photos, and for each photo there is a “prep for photo” screen. Taking all four photos, we display a “playback” animation, of each photo. The photo booth app has more lines of code than makes sense to explore within this blog post. However, if you’ve followed along this far, feel free to explore these functions further. (And if you’re feeling super excited, perhaps you might even want to code up some additional features of your own?). Running the photo booth code as soon as the Pi starts up. Subscribe to my blog to stay informed of my progress.